Israeli soldiers abducted, on Thursday at dawn, at least seven Palestinians from several parts of the occupied West Bank, the Palestinian Prisoners Society (PPS) has reported. The PPS said the soldiers invaded and searched several homes, and interrogated many Palestinians while investigating their ID cards, before abducting seven. The PPS office in Tulkarem, in northern West Bank, said several army vehicles invaded Allar town, north of the city, and abducted three Palestinians, identified as As’ad Ziad Shadeed, 28, Mo’men Jihad Kharouf, 23, and his brother Malek, 20. Furthermore, the soldiers invaded Jenin, in northern West Bank, searched homes and abducted a young man, identified as Mohammad Suleiman Sa’adi. 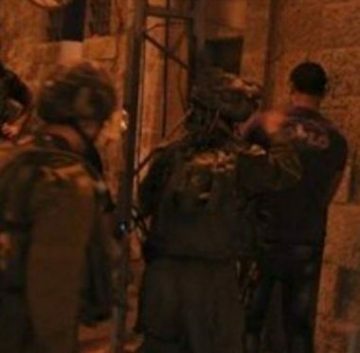 The soldiers also abducted Abada al-Hawas, from his home in Shu’fat refugee camp, in occupied East Jerusalem. In Bethlehem, the soldiers abducted Ahmad Mousa Ramadan, while Ayyoub Nafeth Abdul-Basset was abducted from his home in Hebron, in southern West Bank.